The hashtag on Twitter is really something to behold. Virtually the entire country is mocking President Trump for his ignorant comments. But President Trump should be getting used to this by now. World leaders at the UN laughed in his face when he proclaimed that his presidency had accomplished more than almost any other in history. And it’s not just rakes. Some Finns are showing how they vacuum the forest to really get the job done. One video explains that it’s not Finland’s cold and wet climate that prevents wildfires, but the raking. 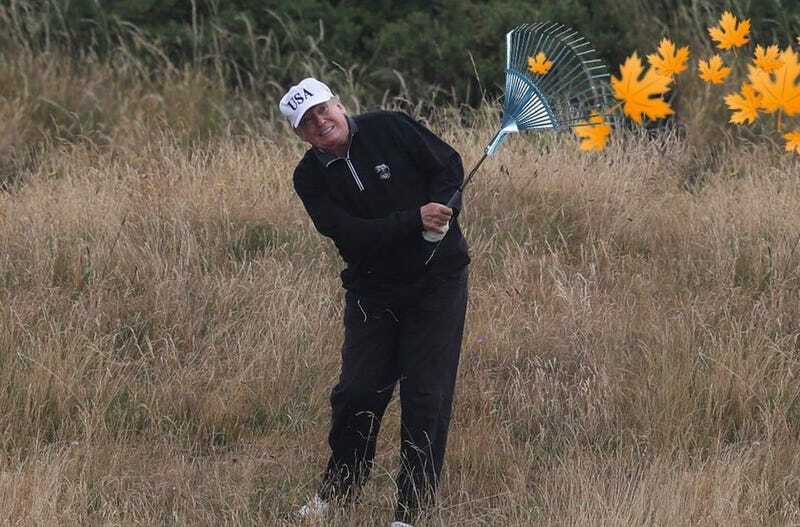 They even have entire schools devoted to raking, he joked. Other countries got in on the act as well, with Germans lamenting the fact that their un-raked forests are vulnerable, and Canadians showing how they rake the forest in the most futuristic ways possible—with their Roombas. For the record, these historic and devastating fires in the United States are being made worse by climate change, not a lack of raking. The long and the short of it? President Trump, no matter what you think of his policies, is simply too dumb to be president. He has no idea what he’s talking about on almost any subject and just makes things up as he goes along. Previous presidents used to have their entire legacies defined by a single gaffe. But we’ll forget all about this raking nonsense by tomorrow because there will almost certainly be some new, mind-numbingly idiotic comment that shows just how dumb our president can be. It’s a scary time for America. But at least we can take solace in the fact that President Trump’s incompetence and lack of intellectual curiosity might actually be making us safer. It’s hard to share vital national security secrets with foreign adversaries when you don’t even read your presidential daily brief. What an idiot. What an absolute idiot. Did a Russian Photographer Smuggle a Surveillance Device Into the White House?